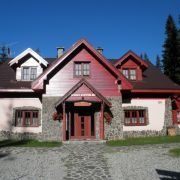 Private facility in Nizke Tatry Mountains, Demanovska Dolina - Jasna, in a close distance to ski lifts. 4 apartment … More » for 4 persons with bathroom, WC, kitchen, 1 apartment (2 rooms, hall with fire place, kitchen, bathroom, WC) for 6 persons. In winter ideal for skiing, in summer for hiking.